Recently I’ve worked with word2vec and doc2vec algorithms that I found interesting from many perspectives. Even though I used them for another purpose, the main thing they were developed for is Text analysis. As I noticed, my 2014 year’s article Twitter sentiment analysis is one of the most popular blog posts on the blog even today. The problem with the previous method is that it just computes the number of positive and negative words and makes a conclusion based on their difference. Therefore, when using a simple vocabularies approach for a phrase “not bad” we’ll get a negative estimation. But doc2vec is a deep learning algorithm that draws context from phrases. It’s currently one of the best ways of sentiment classification for movie reviews. You can use the following method to analyze feedbacks, reviews, comments, and so on. And you can expect better results comparing to tweets analysis because they usually include lots of misspelling. We’ll use tweets for this example because it’s pretty easy to get them via Twitter API. We only need to create an app on https://dev.twitter.com (My apps menu) and find an API Key, API secret, Access Token and Access Token Secret on Keys and Access Tokens menu tab. First, I’d like to give a credit to Dmitry Selivanov, the author of the great text2vec R package that we’ll use for sentiment analysis. You can download a set of 1.6 million classified tweets here and use them to train a model. Before we start the analysis, I want to point your attention to how tweets were classified. There are two grades of sentiment: 0 (negative) and 4 (positive). That means that they are not neutral. I suggest using a probability of positiveness instead of class. In this case, we’ll get a range of values from 0 (completely negative) to 1 (completely positive) and assume that values from 0.35 to 0.65 are somewhere in the middle and they are neutral. # 3 - the query. If there is no query, then this value is NO_QUERY. As you can see, both AUC on train and test datasets are pretty high (0.876 and 0.875). Note that we saved the model and you don’t need to train it every time you need to assess some tweets. Next time you do sentiment analysis, you can start with the script below. Ok, once we have model trained and validated, we can use it. For this, we start with tweets fetching via Twitter API and preprocessing in the same way as with classified tweets. 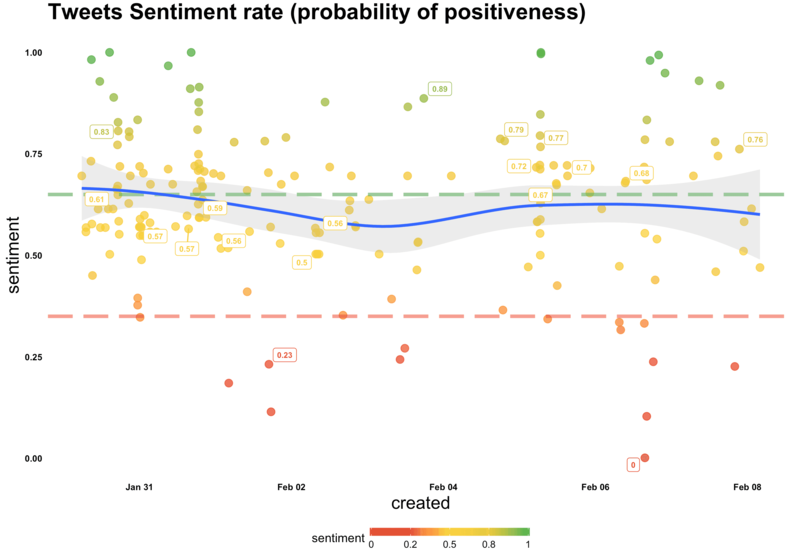 For instance, the company I work for has just released an ambitious product for Mac users and it’s interesting to analyze how tweets about Setapp are rated. The green line is the boundary of positive tweets and the red one is the boundary of negative tweets. In addition, tweets are colored with red (negative), yellow (neutral) and green (positive) colors. As you can see, most of the tweets are around the green boundary and it means that they tend to be positive.